Once held by the few, it was hoarded and jealously guarded, like currency. But the technological revolution of the past two decades has made possible a new form of power, one that operates differently, like a current. ‘New Power’ is for the many; it is open, participatory, often leaderless and peer-driven. Like water or electricity, it is most forceful when it surges. The challenge with new power is not to hoard it, but to channel it. New power is what fuels the rise of participatory communities like Facebook and YouTube, sharing services like Uber and AirBnB and rapid-fire social movements like Brexit and #BlackLivesMatter. It explains the unlikely success of Barack Obama’s 2008 campaign and the unlikelier victory of Donald Trump in 2016. And it gives ISIS its power to propagate its brand and distribute violence. Even old power institutions like the Papacy, NASA and LEGO have tapped into the strength of the crowd to stage improbable reinventions. 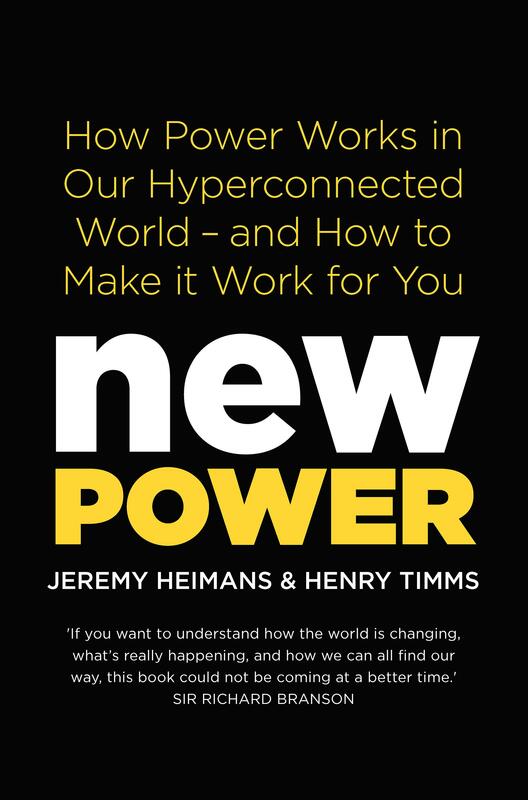 In New Power, the business leaders/social visionaries Jeremy Heimans and Henry Timms provide the tools for using new power to successfully spread an idea or lead a movement in the twenty-first century. Drawing on examples from business, politics, and social justice, they explain the new world we live in-a world where connectivity has made change shocking and swift and a world in which, more and more, everyone expects to participate.